Owen Cunningham Wilson (born November 18, 1968) is an Academy Award-nominated American actor, comedian, producer and screenwriter. Wilson was born in Dallas, to photographer Laura (Cunningham) Wilson and Robert Andrew Wilson. He has an older brother, Andrew, and a younger brother, Luke. Both brothers are also involved in movie making. Wilson went to the University of Texas at Austin. He graduated with a Bachelor of Arts in English. The Sheryl Crow album C'mon C'mon has the song "Safe and Sound". The liner notes say it is about Wilson and Crow's relationship. On August 26, 2007, Wilson was taken to St. John's Health Center. It was reported as a suicide attempt. He was later moved to Cedars-Sinai Medical Center in Los Angeles. His lawyer later said that Wilson had depression. A few days later, Wilson withdrew from starring in Tropic Thunder. He dated Kate Hudson in 2006. The pair broke up. It was widely reported that he tried to commit suicide in 2007 after the relationship with Hudson ended. In 2008, it was reported the pair were to marry. However the two would again break up and make up a number of times over 2008 and 2009. On January 10, 2011, Wilson's representative said that Wilson and his girlfriend, Jade Duell, were expecting a baby. Just four days later, on January 14, it was Duell gave birth in Hawaii to a baby boy, Robert Ford Wilson. Wilson is a fan of several Dallas-area professional sports teams. He has been spotted at Dallas Cowboys, Dallas Mavericks and Texas Rangers games. He is also a supporter of the English football team Chelsea F.C..
Wilson's bumped nose is because he broke it twice. Once was during a high school fight, and once playing football with friends. 2001 King of the Hill Rhett Van Der Graaf (voice) Episode: "Luanne Virgin 2.0"
2013 Drunk History John Harvey Kellogg Episode: "Detroit"
2014 Cars Toons: Tales From Radiator Springs Lightning McQueen (voice) Episode: "The Radiator Springs 500 ½"
2016 Saturday Night Live Hansel Episode: "Larry David/The 1975"
↑ "Monitor". Entertainment Weekly (1181). November 18, 2011. p. 34. ↑ "Today in history: November 18". msnbc.com. 2006-11-18. Retrieved 2012-04-13. ↑ "Owen Wilson: Battling Depression". Newsweek. 2007-10-14. Retrieved 2008-06-14. 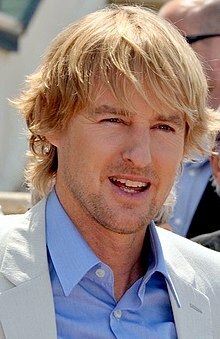 ↑ "Owen Wilson to wed Kate Hudson - a year after he 'tried to kill himself' when she dumped him". Daily Mail. London. 2008-05-11. ↑ Hammel, Sara. "Baby on the Way for Owen Wilson", People, January 10, 2011. ↑ "Owen Wilson becomes a father". USA Today. 2011-01-15. Retrieved 2011-01-17. ↑ "Revealed: Owen Wilson Names Son Robert Ford". People. 2011-01-19. Retrieved 2011-01-19. ↑ "Nominations & Winners". Hollywood Foreign Press Association. Retrieved December 20, 2011. ↑ "The 18th Annual Screen Actors Guild Awards". Retrieved January 31, 2012. This page was last changed on 27 December 2018, at 02:40.